Based on the immensely popular movie, The Godfather, this online slot machine includes cliché images of gangsters and organized crime. You could be banking with the high rollers in the well-crafted Slotfather game. Join The Slotfather and his cronies, Sammy Quick Fingers, Fat Tony, and Frankie the Fixer for a chance to win suitcases of cash. Powered by OpenBet gaming software, this 5-reel, 30-payline online slot machine perfectly portrays the romanticized Italian Mafia scene in an entertaining way. 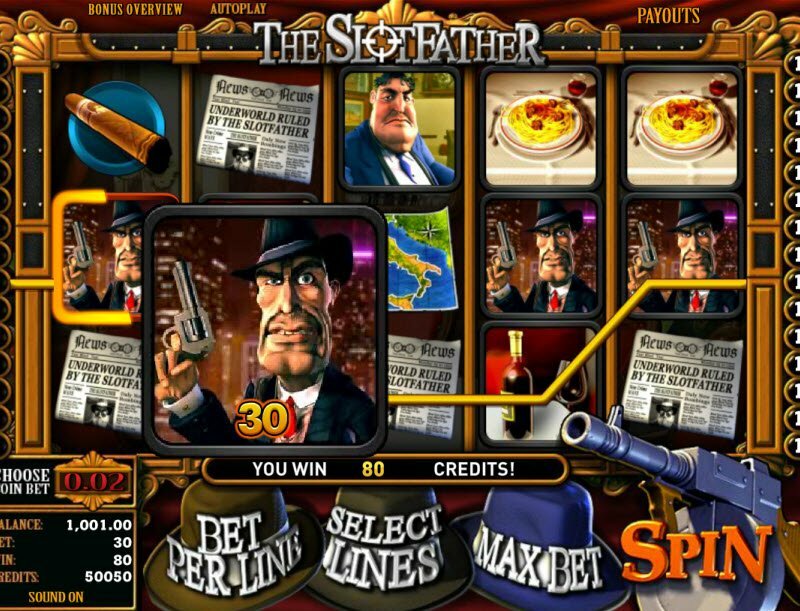 The Slotfather Game evokes classic images associated with the Italian Mafia scene. Spin the reels and you’ll meet the Slotfather along with his cronies dressed to the nines in expensive suits. Slot images include cigars, Tommy guns, fancy vintage cars, bottles of wine, plates of spaghetti, a map of Italy, and more. The background music even recreates the famous theme from the movie, The Godfather. The high-quality images and sound capture the essence of the exciting and dangerous world of organized crime. 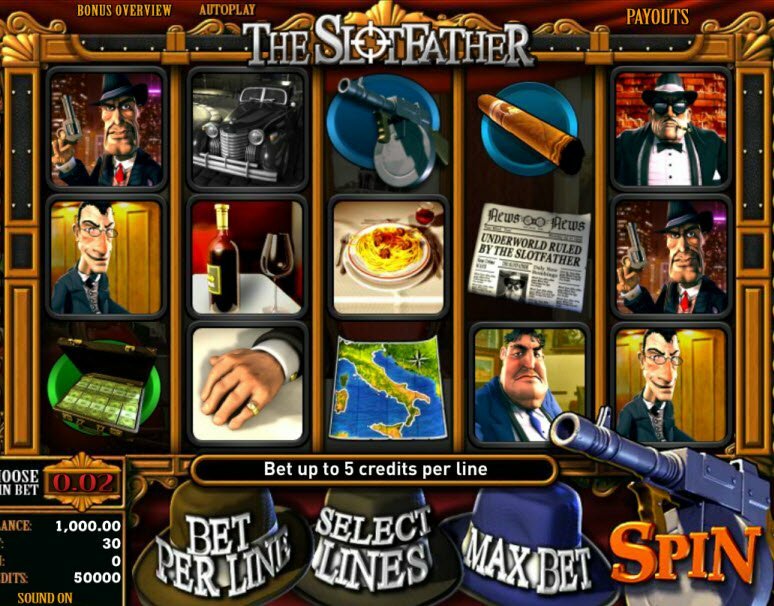 The Slotfather Game evokes classic images associated with the Italian Mafia scene. Spin the reels and you’ll meet the Slotfather and his cronies dressed to the nines. Slot images include cigars, Tommy guns, a fancy vintage car, bottles of wine, plates of spaghetti, a map of Italy, and more. A Jackpot You Can’t Refuse! The Slotfather will offer you a jackpot you can’t refuse. The game has cleverly designed bonus features that make this one of the best video slots available online. Each of the bonus features corresponds with one of the Mobsters. For example, if the Sammy “Quickfingers” symbol appears on either side of the suitcase symbol on lines 1, 2, or 3, the Sneaky Instant Win feature triggers. Sammy will reach out of his symbol box towards the direction of the Suitcase symbol. He then grabs a loose bundle of cash from the Suitcase, bringing it back into his symbol box to award you with instant bonus credits. If the Frankie “The Fixer” symbol appears on either side of the Tommy Gun symbol, the Multiplier Mob Free Spins activates. Frankie will reach out of his symbol box and grab the Tommy Gun shooting holes all over the main game screen. You then can choose one of the bullet holes to reveal your free spins and payout multiplier. The Slotfather game features a great bonus round in line with the Mob theme. 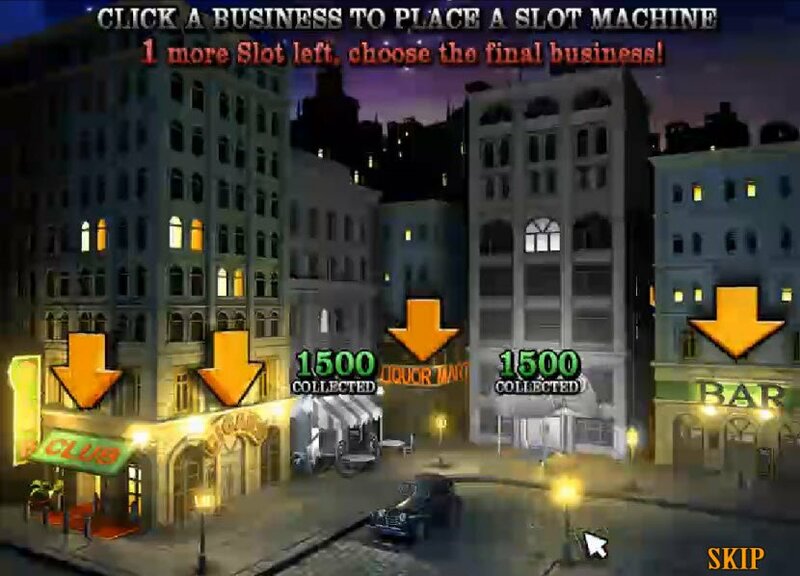 Become a good earner for the Slotfather by placing his Slots in various businesses in the city. Then you choose 3 out of 6 businesses. Once all 3 are chosen, you will visit the Slotfather’s Italian restaurant. Sit at his table with the Slotfather and his goons to discuss the good work you have done and bonus winnings.